Use the AWS Plugins to effortlessly integrate data streams from AWS IoT to Ubidots. To connect AWS and Ubidots, you can use the AWS Plugin offered by Ubidots which automatically links AWS resources (AWS IoT Core, AWS IoT Rules, and AWS Kinesis Data Streams) for you to stream data directly to your Ubidots powered Apps. 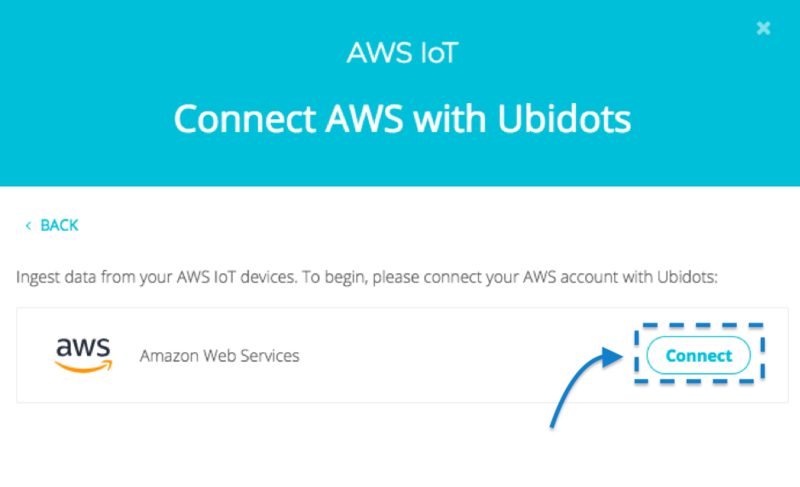 This user guide explains how to integrate AWS IoT with Ubidots using the AWS Plugin offered by Ubidots and an AWS Access Key. This integration will automatically create the integration between AWS and Ubidots using the below data-flow diagram. NOTE: For an advanced setup using AWS IAM Role to integrate AWS IoT with Ubidots, please reference to this guide. AWS IoT Core allows you to connect devices to the AWS cloud. 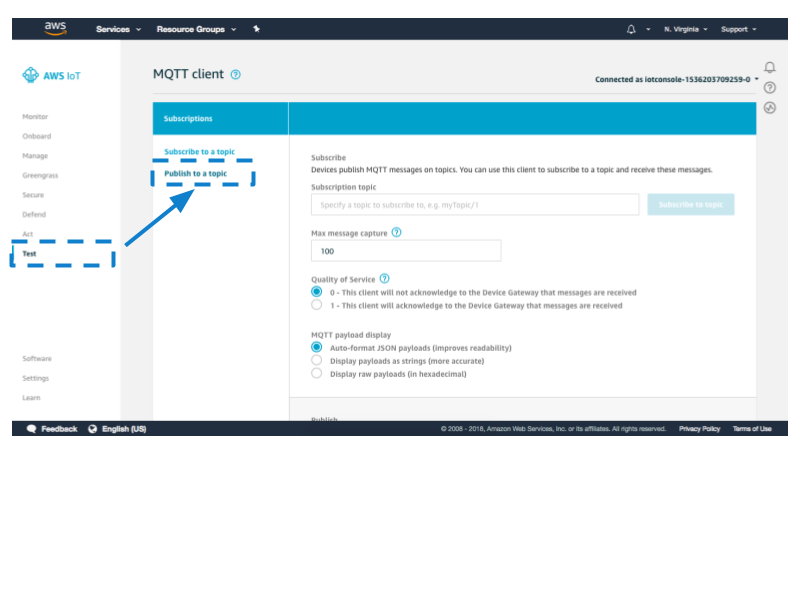 You can think of AWS as a managed MQTT broker that accepts any type of message, then routes it to other AWS services and resources. AWS IoT Core does not store your sensor data. It is only an intermediate broker to route messages between your devices and other AWS services. AWS IoT Core doesn't have a predetermined JSON structure. As a platform that targets software developers, AWS IoT Core accepts arbitrary JSON payloads, which are then interpreted by self-built, native web applications. Ubidots is different because we've already built that web application for you, and that application needs a predetermined JSON payload structure so we can extract the Ubidots device label, variable label and value. AWS IoT Core doesn't accept non-encrypted connections. AWS IoT Core provides authentication and end-to-end encryption throughout all points of connection, so that data is never exchanged between devices and AWS IoT Core without proven identity. This is a plus in terms of security, but it can also slow down your prototyping phase. Persistence: With Kinesis you expect your data to be queued reliably until it reaches its destination. Speed: Kinesis is designed for real-time data streaming, making it suitable for IoT use cases. Cost: Kinesis uses a simple pay as you go model where the main cost is based on "shards". Each "shard" has a capacity of 1,000 records/second and starts at $10.8 / month. Forwarding your data through Kinesis is more cost-effective than other approaches such as AWS Lambda. With the above understanding, let's get started with the integration! Ubidots uses an AWS Access Keys to securely create the required AWS resources to stream data to Ubidots. Using the Access Key Ubidots will create an AWS IAM Role to automatically execute the integration for you. To retrieve your AWS Access Keys, go to your AWS IAM Management console, then click on “Users”, and create a new User with “Programmatic Access” and set the permission policy “IAMFullAccess.” Here is a quick video to guide you. Once created, copy the “Access key ID” and the “Secret access key” which will be used later to complete the AWS Plugin on Ubidots platform. IMPORTANT NOTE: As a security measure, Ubidots does NOT store any AWS Access Key IDs or Secret Keys. 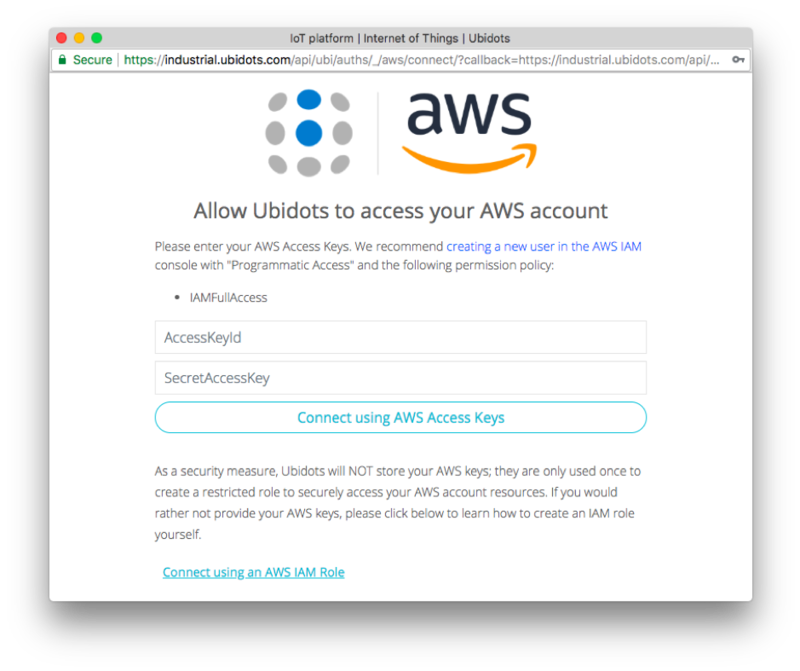 The permission with Access Keys is used only once at the beginning of a Plugin's setup to create a restricted role in AWS and securely setup AWS resources to stream data to Ubidots. If you’d rather not provide your AWS keys, an advanced integration can be setup using AWS IAM Role and this user guide. Now with your Access key ID and Secrete access key, we'll move back to your Ubidots Admin account and execute the below 4 steps to add the AWS Plugin and start streaming data. Step 2: Select the "AWS IoT." 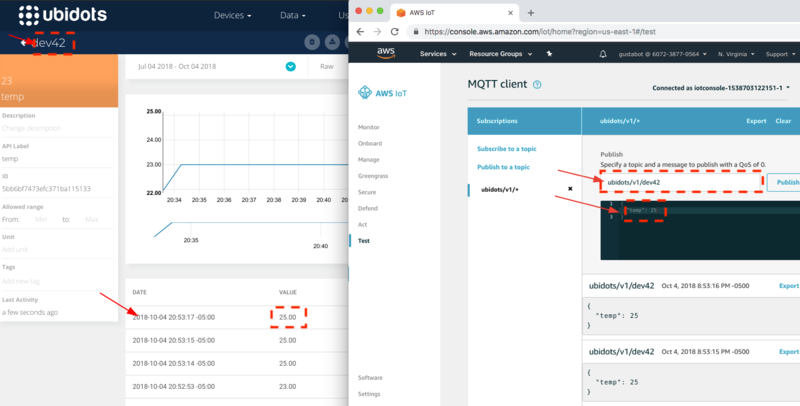 Step 3: Click “Connect” to link your AWS IoT account with Ubidots. Step 4: Enter your AWS Access Key ID and Secret Access Key created earlier in this guide. By entering your AWS Access Key, Ubidots will automatically setup the required resources in AWS to complete the integration and begin streaming data to Ubidots that is flowing to AWS IoT. 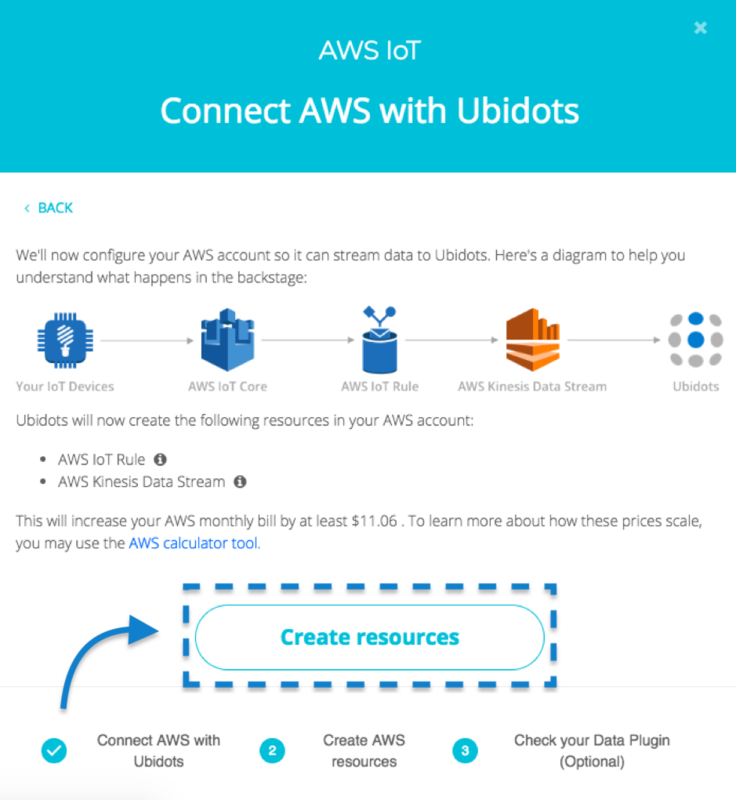 After plugging Ubidots into your AWS account, Ubidots will automatically create the required resources to stream data from an AWS IoT device to Ubidots. AWS IoT Core: This is AWS’ managed cloud platform for connected devices to securely interact with cloud applications, AWS services and other devices. By default, all AWS accounts have this module enabled. Ubidots will not create an IoT core for you. Learn more. AWS IoT Rules: A feature within AWS IoT Core, which give your devices the ability to interact with AWS services. 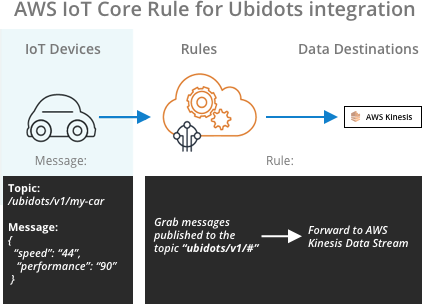 Ubidots will create one IoT Rule to route your device traffic to an AWS Kinesis Data Stream. Learn more. AWS Kinesis Data Stream: This is AWS real-time data streaming service, which allows developers to create applications that collect and process large streams of data in real time. Ubidots will create one Kinesis Data Stream. Learn more. Note: The IoT Rule that Ubidots creates on your behalf automatically routes all traffic going to the topic “ubidots/v1” through the AWS Kinesis Data Stream to Ubidots. This allows you to keep other devices private from Ubidots by simply creating a new topic. In this guide we've learned how to setup a Data Plugin so that data can be sent to AWS IoT Core and then forwarded to Ubidots where you can simply develop and deploy your IoT Solution. Although AWS IoT Core is a generic broker that allows you to send arbitrary JSON messages, in order for Ubidots to understand the payload, please utilize the below JSON structure.